This photo was taken on Christmas Eve 2015. For once we were all together in the same place at the same time. Little did we know this would be the only full family photo we would ever have. On 1st January 2016 Mum started to feel unwell. Recently retired and enjoying this extra time on her hands she was a fit, healthy lady with no medical issues. By 8th January Mum had turned yellow and I urged her to attend hospital for tests. Mum was admitted and stayed for 2 weeks having scans and many tests and procedures. On 1st February came the devastating news that they had found an aggressive tumour in her bile duct which required urgent treatment. A stent was inserted into the duct and at the beginning of March, Mum began weekly Chemo sessions. 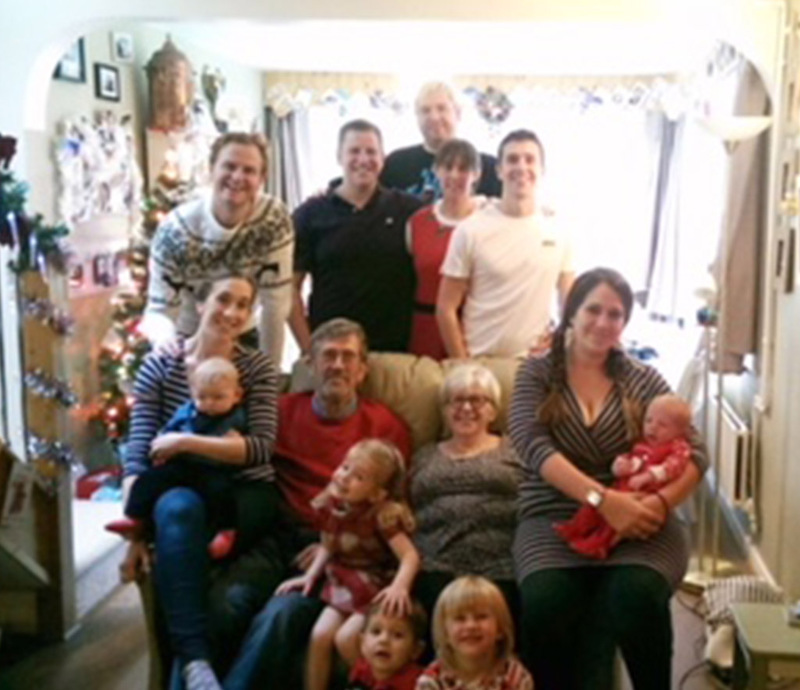 She remained positive throughout months of this difficult treatment fuelled by the love for her family, especially her grandchildren who she so very much wanted to see grow up. After 18 weeks Chemo was stopped as It had caused further complications requiring hospital admissions. Eight months after first becoming ill, Mum was rushed to hospital very unwell. Unfortunately, her body could fight no more, the cancer had spread and there was nothing we could do. On the morning of 12th November 2016 Mum peacefully passed away with her devastated husband by her side, she was only 66. As a family we are extremely proud of how she fought and kept positive through that terrible, dark time. As we grieve we gain strength from the wonderful memories our Mum has given us throughout our childhood and hope that with AMMF we can spread the word and raise money towards continuing research into this silent killer. In Memory of Our Mum Gillian Bayton (30.7.50-12.11.16).